I have been so busy cutting coupons that I haven’t cooked in WEEKS. UGH! What is wrong with me? I’ve stocked up on Healthy Choice meals, peanut butter and mayonnaise while saving big bucks at CVS and Walgreens. We’ve just been living off of canned and microwavable meals instead of freshly cooked dinners. Need to get back on that horse. Are you thinking of throwing a Super Bowl party? 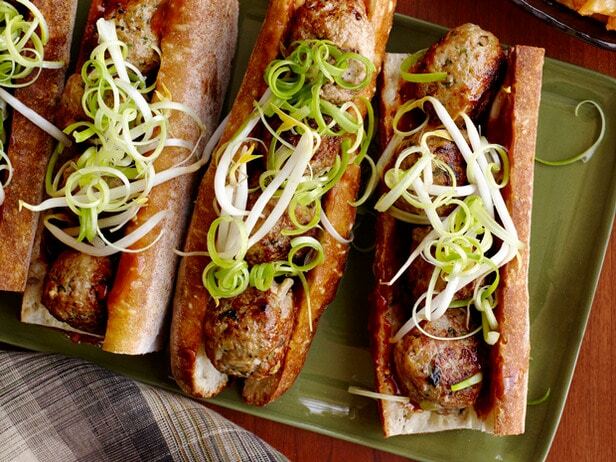 I am pretty sure we aren’t doing anything this year, but I wanted to pass along this great recipe from the Food Network for ‘Asian Meatball Subs With Hoisin Mayonnaise’. Tear the sandwich bread into small pieces, then toss with the milk and soy sauce in a large bowl. Let stand 10 minutes. Meanwhile, mince the scallion whites. Cut the scallion greens into thin 2-inch-long strands. Put the strands in a bowl of ice water and refrigerate while you make the meatballs. Add the scallion whites, pork, garlic, ginger, water chestnuts, egg, cilantro, 1 teaspoon sesame oil, 1 1/4 teaspoons salt and 1/2 teaspoon pepper to the bowl with the bread; mix until combined. Gently form into 16 golf ball-size meatballs. Put the meatballs on a baking sheet, cover with plastic wrap and refrigerate 1 to 4 hours. Stir the hoisin sauce, mayonnaise, 11/2 tablespoons lime juice, the chili-garlic sauce and the remaining 1/2 teaspoon sesame oil in a medium bowl. Cover and refrigerate until ready to serve. Heat about 1 1/2 inches peanut oil in a large, wide saucepan over medium heat until a deep-fry thermometer registers 350 degrees F. Add the meatballs in batches and cook, turning occasionally, until browned and cooked through, 8 to 10 minutes. Transfer to a paper towel-lined plate to drain. Drain the scallion greens and toss with the bean sprouts, the remaining 1 tablespoon lime juice and a pinch of salt in a bowl. Spread the hoisin mayonnaise on the inside of the baguette pieces, then fill with the meatballs and top with the scallion-sprout mixture.